I really love the fresh aroma of mint. Research study has said that the aroma itself stimulates the salivary glands, there by increasing digestive enzymes and facilitates the digestion. I bought 2 large bunches of mint leaves from near by Indian grocery store. Two days back I made mint pulao for lunch, I already posted that recipe in my blog. 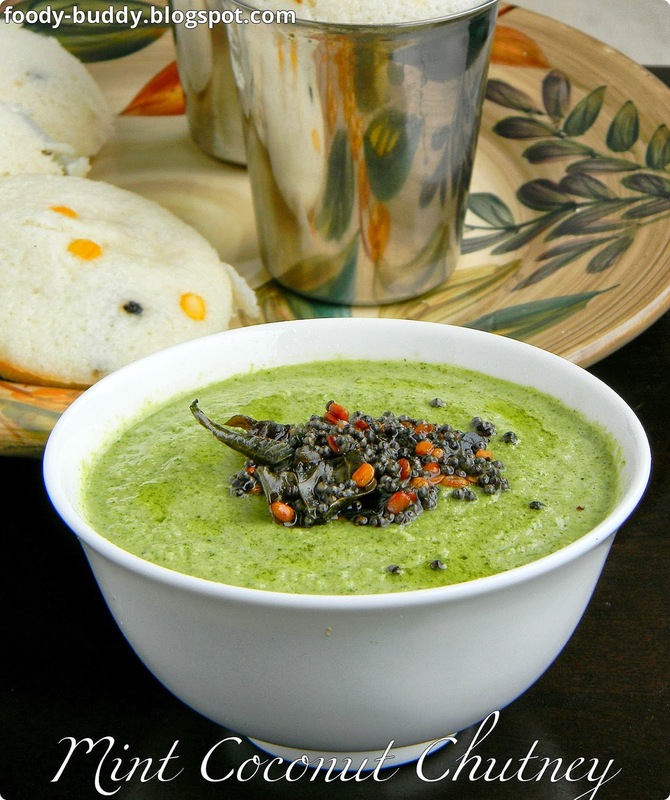 For today breakfast, I made this pudhina coconut chutney for idly. It just tastes yummy with dosa and paniyaram too. 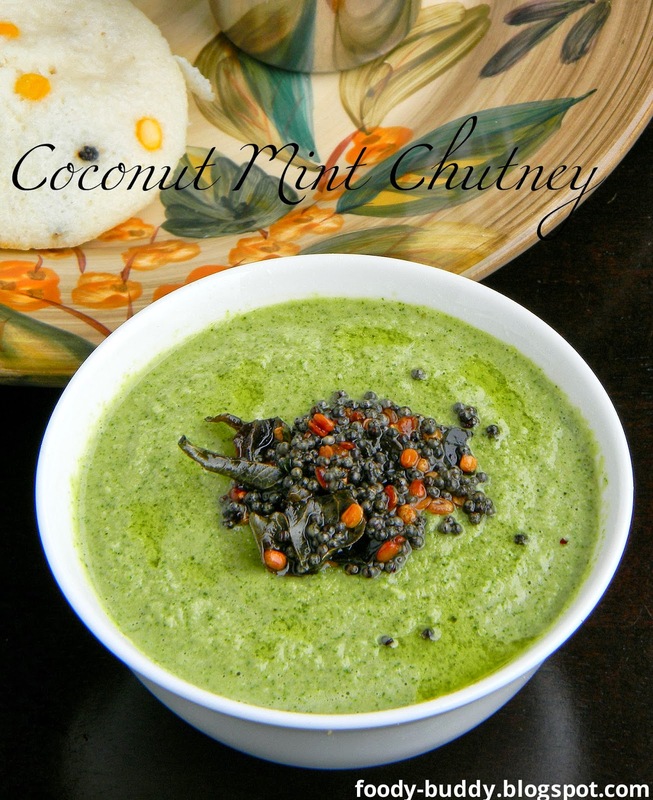 Do try this mint chutney with coconut and let me know how it turned out. Wash the mint leaves and drain the water. Heat a pan with oil, add mint leaves, saute this for a 1-2 mins in a medium flame until it shrinks in volume. In a blender(mixie), add coconut, roasted bengal gram, green chilies, ginger, garlic, tamarind, salt, water and finally add mint leaves. Grind it to a smooth paste. Transfer this to a bowl. Heat a same pan with little oil, add mustard, urad dal, curry leaves and asafoetida, after it splutters, transfer this tempering to ground chutney. Mix well with spoon. Yummy mint coconut chutney is ready to serve with idly or dosa or paniyaram. 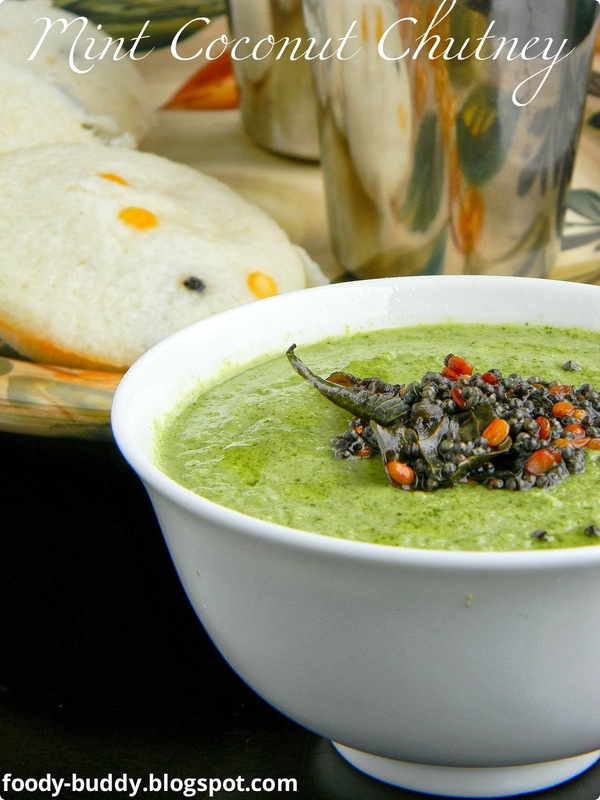 You can also add 1/2 cup of mint leaves and 1/2 cup of coriander leaves to make this chutney. Addition of ginger and garlic gives a nice flavor to this chutney. Addition of tamarind gives a nice tangy taste. You can also add curry leaves while grinding instead of adding them to tempering. Adjust the no of green chilies according to your taste. Here I used thai green chilli, it was spicy so I added 3. Aroma of mint, activates the salivary glands, there by increasing digestive enzymes and facilitates the digestion. Soothing the digestive tract, if you are having any stomach ache. Eliminates the toxins from the body. Helps in whitening teeth and combats bad breath. Good cleanser for the body.